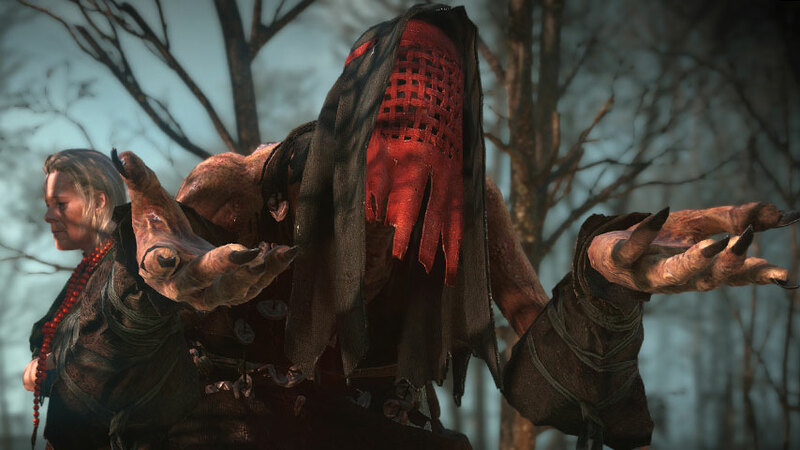 The Witcher 3 gets a bit creepy – creepier? – at The Whispering Hillock. The Whispering Hillock is pretty much our last required stop for this visit to Velen; it will wrap up Family Matters as well as the entire Velen sequence of the In Ciri’s Footsteps quest. Don’t worry though, finishing it won’t close any leads or activities. You need three ingredients to free the creature in the Whispering Hillock, but one is already in your possession thanks to an earlier quest (Ladies of the Wood). Let’s move on to finding its bones. Head west to the indicated area, killing the Water Hag guarding it. If you stand in the centre of the search area, engage Witcher Senses, and spin, you should spot the tombstone easily. Your next step is to catch a black horse – this might be the first time you use this trick, if you’re not an Axii fan. Cast the sign on a black horse and quickly approach and press X/A to mount. Then just ride it right into the cave with the creature. Should you free the creature in The Whispering Hillock? You have the opportunity here to complete the ritual, or change your mind and kill the creature. This has consequences in the Return to Crookback Bog quest later on. SPOILER ALERT: Tune in after the italics if you don’t want to know the consequences of your choices. If you free the creature, it destroys the nearby village of Downwarren. The orphans escape into the swamp, but locals believe they will die alone out there. Gran, who is the Baron’s wife, Anna, will be transformed into a Water Hag and ultimately die. The Baron commits suicide, and his men rampage across the countryside, bringing misery to its inhabitants. If you kill the creature, you face a battle with multiple Endrega; every time they give you breathing room, attack the heart, washing it with regular gusts of Igni. The village of Downwarren is unharmed. The orphans fate is unknown, but they have vanished. The Baron and Anna both live, and Tamara and the Baron are slightly reconciled. The local countryside remains relatively peaceful. Regardless of your choice, when the deed is done, seek out the Eolderman in Downwarren to receive the token you need to prove your faithfulness to the Crones. At this stage, you’ll experience several interesting revelations which may affect your feelings about your choices so far. Well, that’s The Witcher for you. You’ll also finally learn more about Ciri’s adventures. We can now finally advance the Family Matters quest. Return to Crow’s Perch and speak with the Baron to eventually learn more about Ciri. As Ciri, battle the Basilisk; you’ll have to rely on pure sword work here, but as ever Based Ciri is overpowered as heck. When the battle and cutscenes end, clamber about on the rocks near the base of the tower until another cutscene triggers. If you’ve ever played an RPG before you will not be surprised to learn that after all this faffing about in Velen Ciri’s not even here. You can optionally accept the Return to Crookback Bog mission during the conversation. On that note, now is a great time to go do a bunch of side quests and thoroughly explore the sections of Velen you’ve already visited. After that, we’re off to the Pyres of Novigrad mission. Onwards to Pyres of Novigrad, or back to The Witcher 3: Act One – Velen.